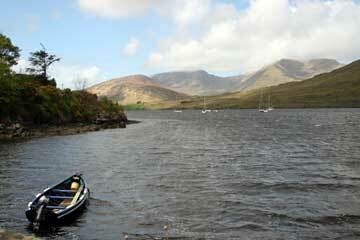 Killary Harbour is Ireland’s only natural fjord. 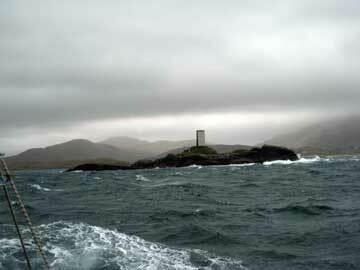 The mouth of the harbour has several rocky unmarked headlands and islands. The harbour entrance is marked only by a range marker installed by Queen Victoria so the British Navy of the day could sequester their ships here. As it is quite protected from the ravages of the open ocean, there are salmon and mussel farms along the south shore for much of its length. Killary is a spectacularly isolated and stunningly beautiful place, with only an extreme sports adventure centre and a small village, Leenane, along its shores and the Maamturk mountains of Connemara flanking its southern periphery. Leenane has a hotel, two restaurants, four cafes, three pubs, several B&Bs, a convenience store, a fuel station and a sheep and wool museum. Killary has some guest moorings with good holding in a muddy bottom nearby. However, one should not venture much beyond the mooring field as the bottom is strewn with fallen trees. A whole fleet of intrepid sailors anchored here for the weekend and proceeded to wholeheartedly celebrate arrival of spring after a long winter of short days and wet weather. On the day of scheduled return, an unforecast gale blew in straight down the fjord and everyone, except us, went home by car. We stood watch that night over the fleet in the bouncy harbour, where the waves reached five feet and foam blew off their tops. We left the next day on the gale’s tail. 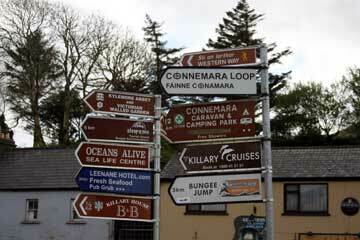 Leenane has become somewhat of a hiking Mecca. Hiking through the unspoiled mountains wither side of the fjord is simply awe inspiring. One of the hikes takes you over massive Mweelrea mountain and then down to Silver Strand, one of the most beautiful long beaches you are liable to ever see  and you are likely to be the only person there.